Press Eye - Belfast - Northern Ireland - Monday 27th July 2015 - Dale Farm Milk Cup 2015 Northern Ireland International Football Tournament - 'Co Down v Brentford FC at Clough 'Co Downs Andrew Gordon in action with Brentfords Showboat Tahir'Picture by Stephen Hamilton / Press Eye. Count Down’s junior side will at least play in the Dale Farm Globe semi-finals after earning a stunning 6-0 win over US side Strikers. Only a blip against Donegal SL on Tuesday could hold them back from the Milk Cup semi-finals in what has been a stunning campaign so far. Captained by Banbridge lad Jack Chambers, the local side made light work of their American counterparts on Wednesday afternoon, cruising to victory thanks to a brace from Lisburn lad Andrew Gordon, a Leo Brown hat-trick and an own-goal. Chambers led by example in the side’s opening 4-0 smashing of Brentford, curling in the third goal from 20 yards out after Hillsborough boy Lee Bailie had set him up. 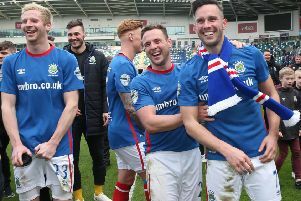 Meanwhile, County Down’s Premier side, including Banbridge lad and Linfield player Lewis Houston were 3-1 up at half-time against Vendee in their final league game.